When I started in photography my Dad said that you have to keep coming up with new ideas in order to make it. Truer words have never been spoken but that sentiment isn’t always easy to achieve. Well a year ago I saw an image that I really liked but it required a lot of finishing to bring out the true essence. Last May at the Planes of Fame Airshow in Chino, CA the skies were alive with warbirds. The focus of the event was on the P-38 Lightning. There were five of the six flying P-38’s in the world at the Airshow and one static photo reconnaissance version from Yanks Air Museum. The numerous fighters. P-38’s included, were lined up along the ramp for static shooting. Well that morning was nothing but overcast skies so there really wasn’t much of a sunrise, although there was a lot of definition in the clouds. While the planes on the ramp faced one way, there was one plane that wasn’t out there and that was Glacier Girl. 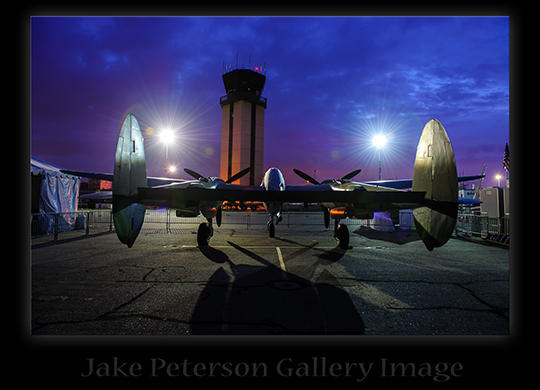 This particular P-38 has a more colorful history as it was brought up from under 258ft of ice on Greenland. This was one of nine P-38’s and 2 B-17’s that were forced to land on Greenland after they ran out of fuel trying to cross over to England during Operation Bolero. They became known as the Lost Squadron. As you can see this 10 million dollar plane was being protected from the wind as it was nestled between some of the tents. It was facing the opposite way from all the other planes and it really caught my eye with the lights behind it. With the D3 and 24-70 f/2.8 it turned out to be really cool, so much so that Dad decided to borrow the idea. Well the image in my head didn’t end there. Something kept hanging me up between the plane, the background and the light. It’s a P-38 Lightning! One of the rarest and most valuable fighters around today. 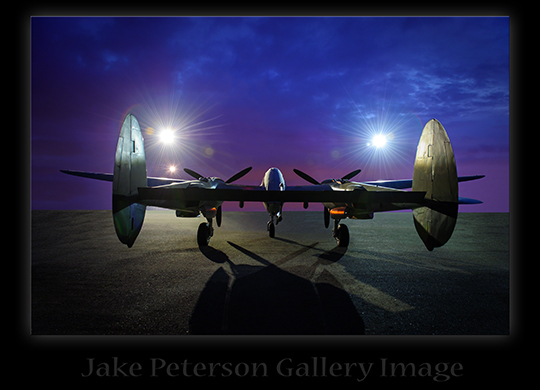 It also has an amazing history, as P-38’s were flown from the start of WWII to the end of WWII in all theaters. Having the plane cramped between all those tents just didn’t fit it, almost demeaning. It had to be brought out. Now this is far from historically accurate and is far from my usual processing area but keeping in mind my Dad’s words it is something new.